A favorite restaurant snack made easy at home. 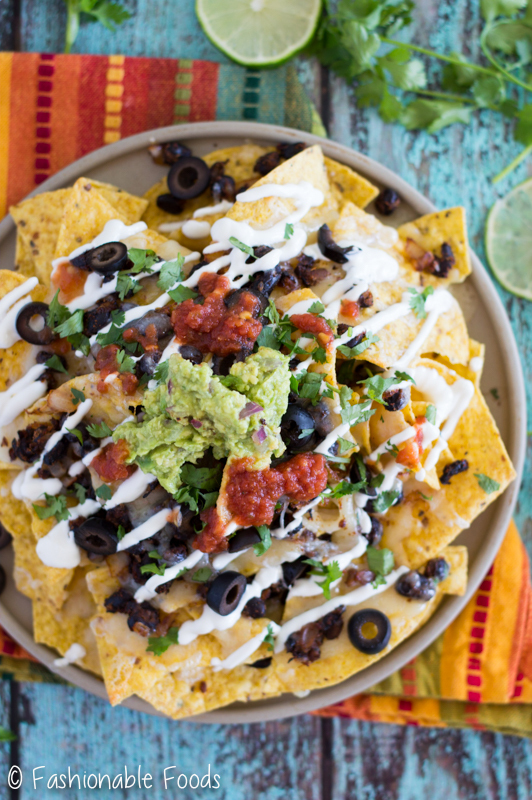 These loaded nachos are topped with cheese, seasoned black beans, and whatever toppings your heart desires! They are a must-have snack for game day! 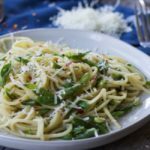 **This post has been updated from 2015 with new photos and a few recipe tweaks. The text has been revised only slightly to reflect the recipe. After two healthier options for Super Bowl snacks it’s only natural I’d have an unhealthy one too. Get out your fat pants. It’s nacho time. Nachos are one of my guilty pleasures. I can’t resist crunchy chips loaded with seasoned black beans and cheese and topped off with tons of guacamole, sour cream, and salsa. I rarely order nachos out because most restaurants top them with a cheese sauce and I hate that – it makes the chips soggy. Plus, they are so easy to make at home! My usual go-to nachos are tortilla chips seasoned with pepper, garlic powder and topped with cheese. 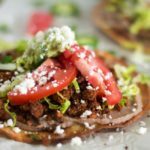 Simple and easy, but so delicious topped with salsa, guacamole, or sour cream. However, I figured I should pull out all of the stops when it comes to a crowd-pleasing snack for the Super Bowl. First up is the seasoning mixture for the black beans. It’s basically a homemade taco seasoning, so if you’re still buying those packets please stop! It’s so easy to make your own and it’s so much better for you. I use chili powder, paprika, garlic powder, onion powder, oregano, cumin, cayenne pepper, salt, and black pepper. These are spices I always have on hand, so it’s really easy to whip up this seasoning whenever I need it. 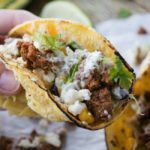 If you’re a frequent taco-maker, you can double or triple the seasoning recipe to keep on hand for quick dinners. Note: Chipotle chili powder makes a great substitute for the chili powder for a smoky version with more heat! Next up is the beans. My original recipe used ground beef, but I’ve found I love these with black beans, so I went with the beans this time around. However, you can use this recipe for ground beef, turkey, or chicken. You can also use another bean, if you prefer. And, if you’re a chorizo lover, you can use that and omit the spice mixture. Gotta love that versatility! Saute the beans with onions, garlic, and the seasoning mixture until cooked. Then, you’re ready to load up the tortilla chips with this delicious bean mixture and tons of cheese! This recipe is definitely meant for a crowd, so if you don’t need that much you can certainly cut it in half. You can keep the extra black beans for salads, tacos, etc. Top these however you like – pickled jalapeños, black olives, salsa, guacamole, sour cream.. you get the point. 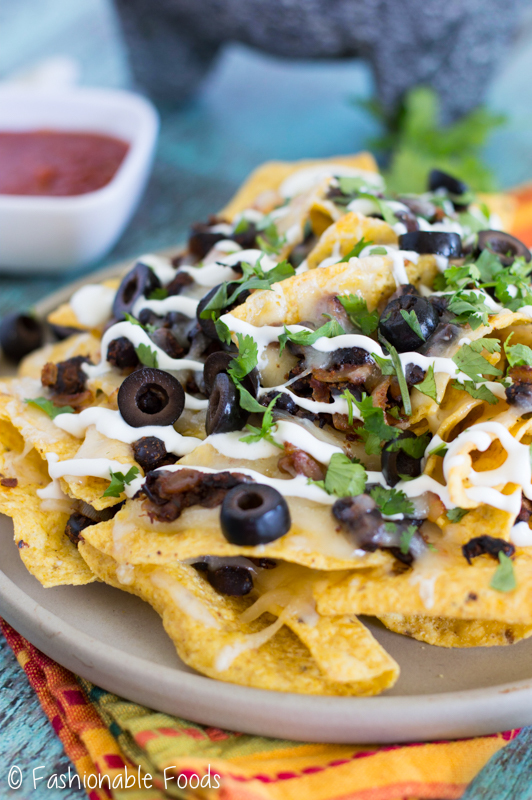 No matter how you serve them up you won’t be able to stop eating these loaded nachos. They are definitely worthy of pulling out the fat pants! 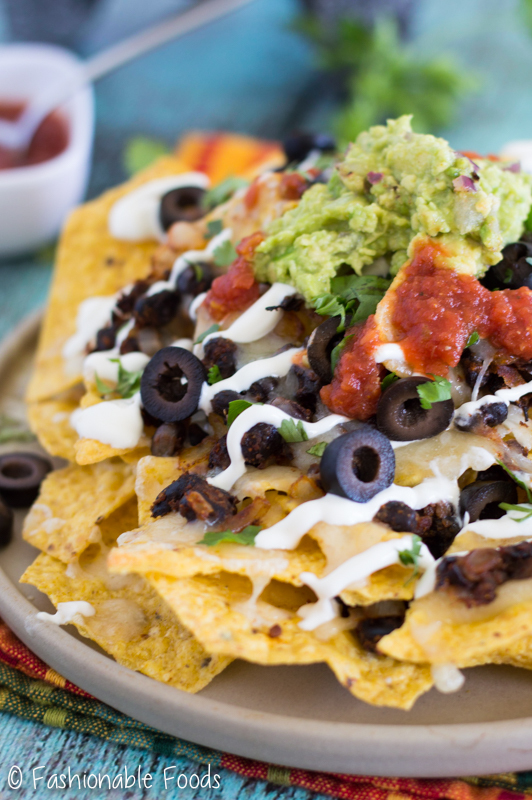 Tortilla chips are layered with seasoned black beans and cheese and baked until bubbly. Top it off with your favorite toppings and dig in! These are a must-have for the big game. Combine all of the spices into a small bowl; set aside. Heat the olive oil over medium-high heat in a large skillet. Add in the onion and sauté for one minute. Add in the garlic, black beans, and seasoning mix. Use a potato masher to mash the beans lightly and cook for about 5 minutes, or until heated through. 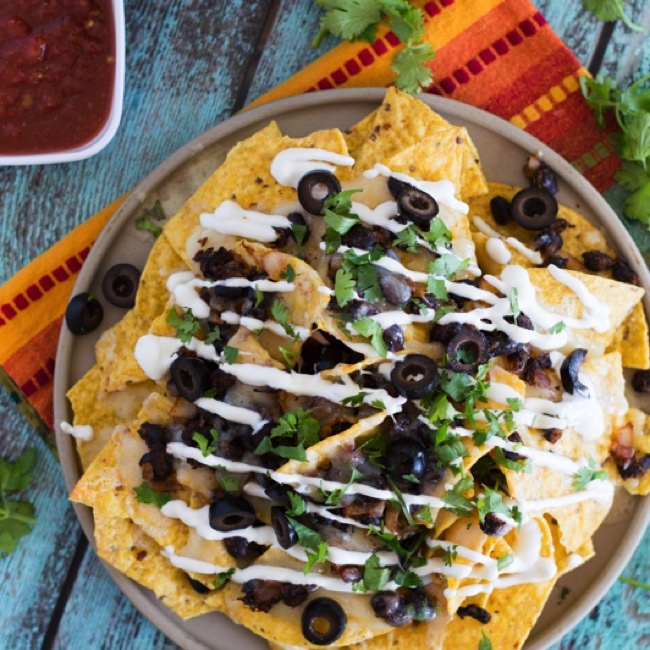 To assemble the nachos, lay out half of the tortilla chips on a large baking sheet. Top evenly with half of the cheese and half of the black bean mixture. Repeat with remaining chips, cheese, and beans. Bake the nachos for 10 minutes, or until the cheese is melted throughout. 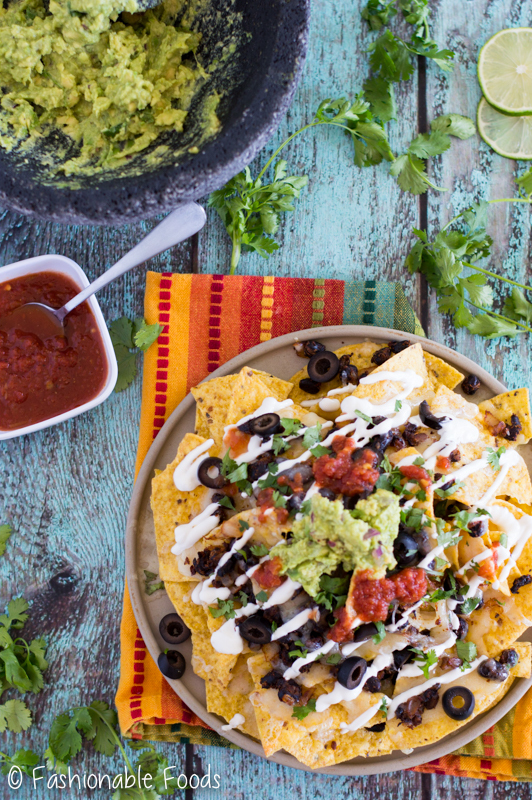 Serve nachos with desired toppings. *For a smoky flavor and more heat, try using chipotle chili powder in place of regular chili powder. *You can use ground beef, turkey or chicken in place of the black beans if desired. 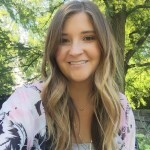 Wow, girl! Thee nachos look absolutely delicious! I’m simply in love!! 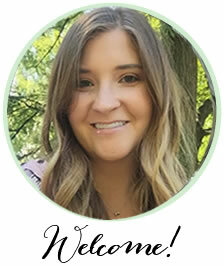 Thank you – they are one of my favorites! I haven’t had nachos in a very long time. We used to make them all the time when I was a teenager, that was before I was worried about calories, cellulite and gravity. I love the idea of Chipotle Chili Powder. 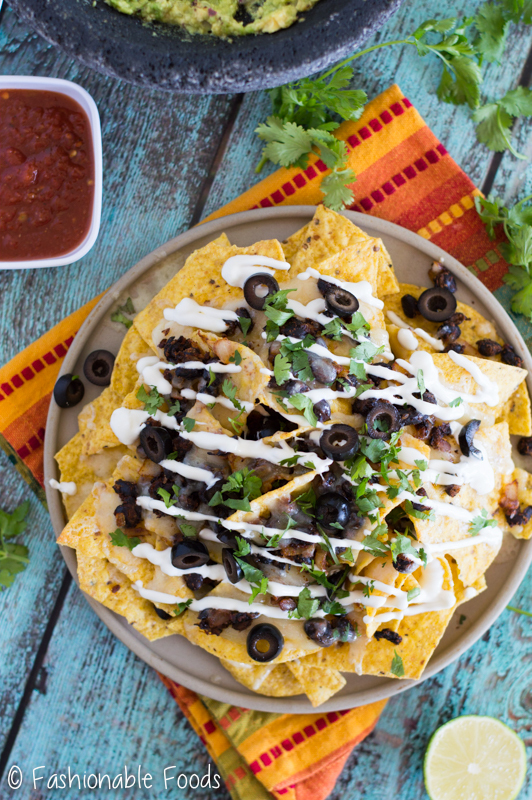 I love nachos so much, so I could never go too long without them… I try and only indulge on occasion! Thanks, Mary!